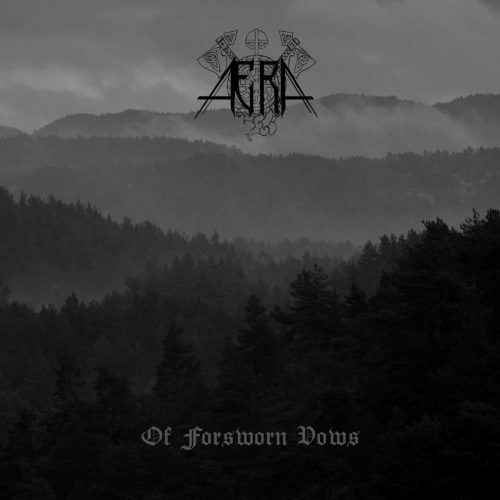 Of Forsworn Vows is the debut EP of a two-man project named ÆRA (the creator of all the music seems to be from Chile, the vocalist from Missouri). 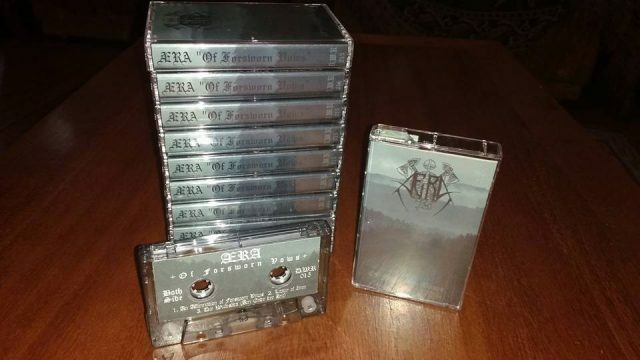 It was digitally released in February, but it’s now available on tape through Desolated Woods Records, and it appears that Aeternitas Tenebrarum plans to make a CD release (the Bandcamp download has been updated so that the tracks now consist of the CD masters). The three songs on Of Forsworn Vows combine gloomy, abrasive riffs, vocals that are both searing and solemn, and shimmering keyboard layers that add a mystical and mythic aura. At speed, the songs embody cold yet chaotic ferocity. In their slower movements, they reach for haunting grandeur and wintry melancholy. Emotionally evocative and immersive music in an icy Norwegian style that’s well-suited by the drifting mists and ancient forests depicted on the cover. Updates on ÆRA‘s Facebook page indicate that the band are far along in recording a full-length album. I look forward to hearing it. The instrumental piece that begins the EP (“Jeka Prve Kiše“) does indeed evoke the mystical beauty of the moon shining over a forested wilderness, as well as a haunting kind of loneliness. When the surge of rushing energy arrives in the dramatic, blood-rushing second track (“Pod Mesecom Prastari Hrast“) through a torrent of blasting drums, fierce riffing, and scalding vocal intensity, an air of dark but dire beauty persists, accompanied by a memorable, folk-influenced melody. The movement into the EP’s solar side also begins with a brief instrumental portion that recalls the EP’s opening, but “Pomen Usnulom Suncu” soon takes flight, racing with wild vibrancy and a trilling folk melody that gets its grips in the head damned fast. The song includes a brief but mesmerizing interlude (more in line with a lunar atmosphere) in which a slow, dreamlike bass melody takes the lead, and finishes in a thrilling burst of instrumental exuberance that seems to convey a fierce joy. The EP begins with an instrumental, and ends with another one — “Zbogom” — which atmospherically seems closer to the mystic glow of the moon than the blaze of the sun, its slow, reverberating guitar melody both entrancing and suggestive of spirits drifting like mists beneath their luminous mistress in the void above. This is a great short release that makes for a dynamic and enthralling journey through spheres that don’t seem quite real, with an almost primordial appeal in the music. 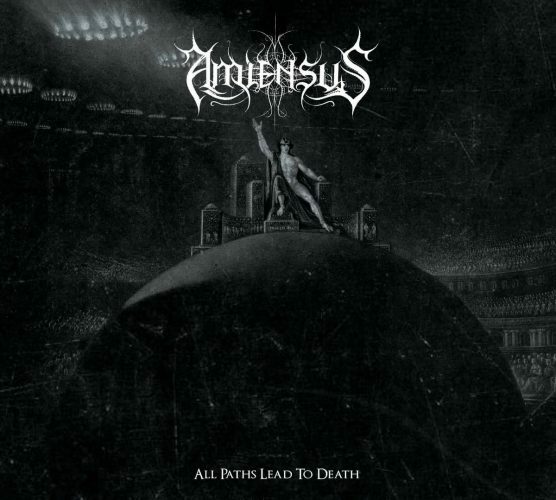 Last fall Minnesota-based Amiensus signed with Apathia Records for the release of a new EP named All Paths Lead To Death, which is now set for release on May 19th. Last month we had the pleasure of premiering the EP’s opening track, “Gehenna“, and last week the band debuted the EP’s second track, “Mouth of the Abyss“. “Gehenna” is a strikingly multifaceted and dynamic track, and one that bears the hallmarks of the style that Amiensus developed through previous releases. “Mouth of the Abyss“, on the other hand, goes hard from start to finish. The deep riffs surge with cold, ominous power, tinged with violence, and the vocals reach heights of unchained and unhinged ferocity (no clean vocals on this song at all). When the pace slows, the music becomes shrouded in gloom and chilling melancholy, and by the end it has risen up like a vision of terrible majesty. Anhedonic is a one-man black/death band from Okmulgee, Oklahoma. I learned about the band after visiting the Facebook page of visual artist Mitchell Nolte a couple of days ago to see if he had posted any new artwork. I went there after seeing his fantastic cover art for the new album by Wode, and it didn’t take long for my eyes to pop open at the sight of the painting above, which he identified as artwork for a forthcoming EP by Anhedonic. These were promising signs, and the music turns out to be very promising as well. The first song that Anhedonic has released from the EP is “Stargazer“. Driven hard by an exhilarating drum line and waves of dramatic and electrifying riffing, it’s an intense experience, and one that seems to leave the earth, carried aloft by high, cosmic shimmering tones and sweeping currents of panoramic melody. The vocals are full of fire and fury, the trilling leads are searing, and the slower passages are both ominous and alluring. Easy to get carried away by this song… which definitely puts this EP on our radar screen. Caoimhín began as the solo project of Pennsylvania composer Kevin Pribulsky, inspired by a desire “to mirror the unrelenting force and silent tranquility of the untouched wilderness”. 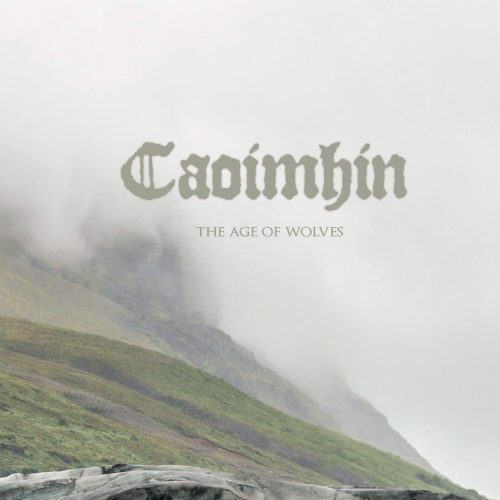 For Caoimhín‘s first release, he enlisted the aid of Norwegian musician Tom Simonsen (guitars, bass, synths, programming) and Norwegian vocalists Cecilie Langlie and Kjetil Ottersen, and he chose harsh vocalist Andrew Malone through a competition. 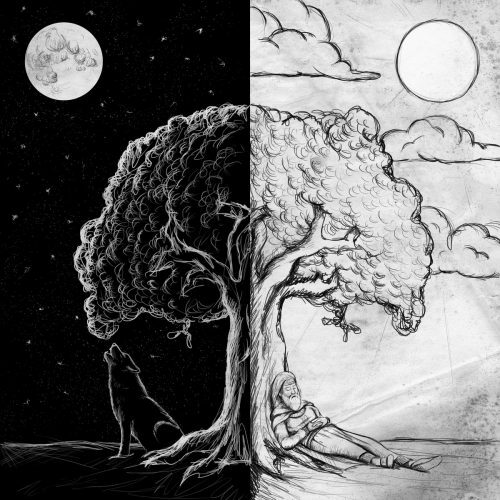 That first release is a two-song EP named The Age of Wolves, which appeared on April 16th and which is thematically rooted in Norse mythology. “Víðarr” is an “ode to the bravery of Óðinn’s son” who, by killing the great wolf Fenrir, “avenges his father’s death and sets the world on a new cycle of death and rebirth”. “Níðhöggr” is “based on the evil serpent who feeds on the dead” and “is a reminder of the ferocity and sheer ruthlessness of the natural world”. Both songs are over 11 minutes long. “Víðarr” is absolutely entrancing… there’s no other word for it. Cecilie Langlie’s angelic voice is the song’s centerpiece, its ethereal quality matched by an acoustic guitar interlude during which her voice soars wordlessly (and it soars again in exhilarating fashion later on). The deep bass thrum and an edge of abrasion on the riffs provide an earthy contrast, with the song as a whole becoming a beautiful and penetrating expression of sorrow, enhanced by a mesmerizing piano solo near the end. 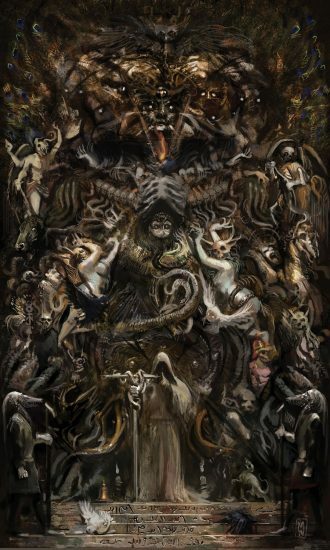 “Níðhöggr” shows more of the conventional trappings of black metal, with Malone‘s voice a bestial snarl, the riffs becoming more jabbing and slashing, the leads more deliriously desolate, and the drum rhythms thriving on double-bass propulsion. Yet acoustic guitar melodies are still to be found here, and the song diverts into a slow, gorgeous, spiritual passage in which Cecilie Langlie’s remarkable voice steals the show again, and another slow, gloomy part in which she’s joined by Kjetil Ottersen‘s deep, wordless vocal tones. Where the first track included a piano instrumental near the end, this one features the somber chords of an organ as a prelude to a wrenching dirge. Caoimhín is at work on a debut album, to be entitled A River Bears Westward.